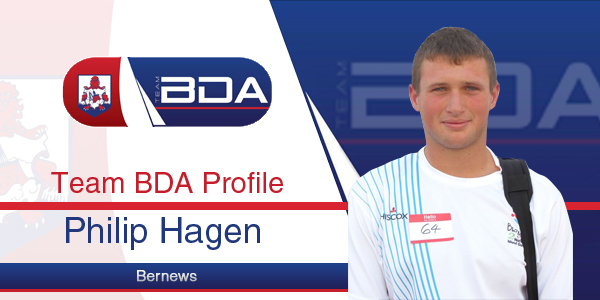 In the second of a series of profiles of members of Bermuda’s team in the Red Bull Youth America’s Cup, we spotlight Philip Hagen, who provided insight into the dedication and training that it takes to represent one’s country at the very highest of levels. A: I am 19-years-old and I am currently a freshman at Queens University of Charlotte in North Carolina studying Finance. Whilst in Bermuda I went to Saltus Grammar School which I graduated from in June of 2015. A: It was actually my physiotherapists idea. Originally when I saw that Bermuda was putting together a RBYAC team I thought that I would need to be a sailor in order to make it. When Craig Brown informed me that they were looking for athletes as well, I decided I would try out and see how things went. A: The chance and challenge to be sailing in the Red Bull Youth America’s Cup [RBYAC] opens up endless new prospects that could lead to career paths, whether as a sailor or as part of a shore team, that I might never have considered prior to being given this opportunity. Cooper Dressler of Oracle Team USA is a perfect example. He sailed in the first RBYAC and now he is one of the grinders for Oracle. One thing is for sure – I will be giving 100 per cent at all times in order to perform at the highest standard for my team mates and for Bermuda. If I’m able to impress our coaches and managers, then maybe I’ll be lucky enough to impress other decision-makers. A: Now that I have made this commitment to be part of Team BDA there is no doubt in my mind that the experience will benefit me, and hopefully Bermuda, for the rest of my life. I have always been involved in team sports as I love the feeling that not only have you accomplished something for yourself, but that you have also been part of something bigger. Hosting the RBYAC is an incredible achievement for Bermuda, and one that will leave a positive legacy for generations of young Bermudians to come. I am just so happy to be able to be a part of making it happen. A: It means a lot. At a young age with swimming all I wanted to do was represent my country and make them proud. Now with the RBYAC coming to Bermuda, I could probably say that winning would leave an everlasting impression as it puts Bermuda on the map as one of the best sailing nations in the world. Q: What excites you most about the lead-up to race time? A: I’m really looking forward to getting to know my teammates more and having more time on the water. We are lucky to have Oracle Team USA providing training and support and hopefully, if we can get an AC45 we can get out on the water as a team and start practising. A: I do believe the the RBYAC will leave a lasting impact in Bermuda, especially with the younger sailors. It gives them something to look up to and to strive for. Young athletes would have never have thought they would be able to make it to the Olympics, but now with all the Olympians Bermuda has produced the young athletes have something to aim for, knowing it is possible since people before you have done it. It’s the same with the RBYAC, younger sailors will have something to strive for since they now know it is possible to be part of such a great event. The team is comprised of 15 young Bermudians who will form the crew, the back-up crew, and shore crew. Team BDA is being funded entirely by donations. Team members include Connor Astwood, Mackenzie Cooper, Peter Dill, Preston Farrow, Na’eem Griffith, Philip Hagen, Kalin Hillier, Mustafa Ingham, Emily Nagel, Daniel Pell, Nicholas Pell, Owen Siese, Dimitri Stevens, Shomari Warner, and Cecilia Wollmann. Fantastic. Great interview. I am looking forward to reading all of them. Sounds like an incredible opportunity.